Vena has use across several business scenarios. We originally started with some basic planning solution to meet our needs and have significantly expanded the scope of our use of the tool into more sophisticated planning and forecasting and into consolidation based on the experience we've had with the tool. We are considering expanding the use of the tool as we see its ability expand beyond what we are currently using it for. Easy integration with Excel. 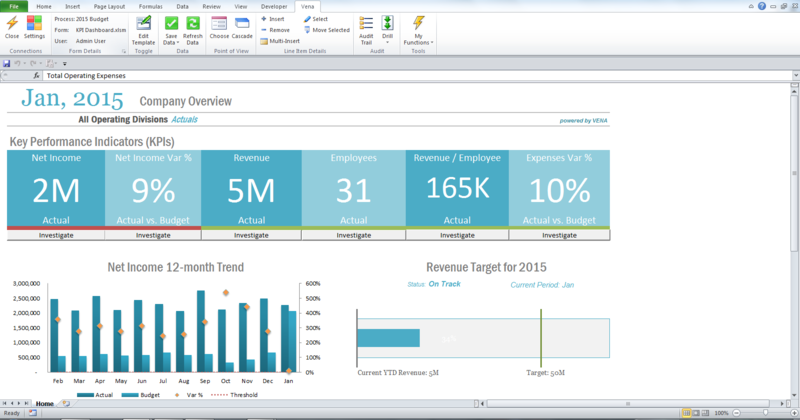 The tool looks familiar as it looks similar to Excel. Great customer support from Vena support team. It has all the advantages of Excel without the limitations of Excel like the audit trail, version control etc. Audit trail feature helps in identifying the source of updates on the data. Efficient aggregation and consolidation tool. The volume of data we handle could not be handled by Excel efficiently. Vena solved the problem. Email integration: Horribly clunky, requires users to share email password with Acumatica to allow use of outbound emails. Should be using a more secure method like access tokens. Expense approval process: Once expense claims are approved, approvers (depending on role) can no longer see the approved/denied claims. Denial of claims requires a manual email/call to submitter instructing them to correct and resubmit the claim. CRM: Allow for tracking of cases by the opportunity in addition to business accounts. This would allow for more accurate tracking of issues related to specific opportunities. Option to add/remove users to processes that are currently active, to grant on-the-fly permission to view current tasks – i.e., it would be nice to modify access irrespective of the process status. My understanding is that this option has already been implemented in later Cloud versions (our company is currently using OnSite version). When tracing mapped data – ability to focus on the source cell, as opposed to just highlighting it (currently the cell is being highlighted, but it can be in any of the worksheets in the source file and needs to be manually located). One is only limited by their knowledge of Excel functions and basic understanding of database management. One does not need to know VBA, VB, C++ or even SQL. I liked the flexibility of Salesforce and the ability to customize look and feel with minimal development involvement. Email integration was smooth and seamless. However, Acumatica's ability to customize certain business processes to meet our particular day to day operational needs and account based fee as opposed to user based fees made it a better option for our organization. Better communication and collaboration on customer accounts through the CRM. Improved month-end close time and more up to date financial information. Slow to implement has been frustrating for the team and has been more expensive than anticipated. We shortened the month-end close time by about 50%. We were able to incorporate more processes than what we originally started with, which, in addition to time savings, ensured error-free reporting and seamless integration of various sub-processes (in the end - resulting in higher-quality deliverables). The ability to maintain and analyze the Audit Trail significantly shortened the analysis of changes and error-checking.